Do you long for a wise spiritual mentor? Sally Clarkson is that for me. She offers hope and encouragement that spills from Godly wisdom and years of experience in living an intentional life, owning her life. I am so very excited to wrap up 2014 and begin 2015 with this book. Since my youngest 3 children were quite young, I’ve been blessed by the wisdom and encouragement of Sally Clarkson. I’ve read several of her books, used Educating the Wholehearted Child when we first began homeschooling and had the opportunity to attend one of her events. God has used her wisdom and encouragement to inspire me as a wife, a mother, and a woman. It is a wonderful gift that I was able to request this book as a review item from the Tyndale Blog Network in late November, and now have it in my hands, before it hits the store shelves! To quote Angela Perritt “The fact of the matter is we all have but one life. Our time here is short- like a vapor, really. Here one day and gone the next.” I know these words so well, as I’m really a late bloomer to the “life intentional” idea. But over the recent years this idea has grown in my life, and with great joy, I see it growing in my daughters! The first chapter of Own Your Life is titled “THE BEGINNING What Will Be the Legacy of Your Life?” In late spring I began a little journal, one that I haven’t shared with anyone, but I call it my “Old Woman” journal. In it, I ponder the idea that the woman I will be at 70 or 80 is the same woman I am purposing to be in my 40s and 50. God was already preparing me to take that thought further in the coming year! If you would like to read the first chapter of Own Your Life, click here. Chapter One is available on Sally’s website. 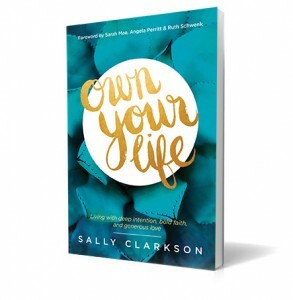 It is with joy and gratitude that I recommend Sally Clarkson’s newest book, Own Your Life, to you. The release date is January 6 and you can pre-order it here. Thankful to the Tyndale Blog Network for the opportunity to read and share my thoughts on this book. Oh Sally, thank you for stopping by. I am so honored. Your “Old Woman” journal is an intriguing idea. I don’t think I’ve heard of anything similar, but I like the sound of it. This is also the first I’ve heard of Own Your Life, so thanks for sharing your thoughts. Nikki, Thank you for stopping by and for commenting! I wish I could remember which book or speaker I first heard about the “old woman” idea. It was a passing comment that stuck in my mind and grew into the journal! I hope that hear more about Own Your Life, or even purchase the book for your self. As I already said, Sally Clarkson is a wonderful wise and encouraging woman.